The Qinqu Jicheng preface, giving background to the history and contents of Fengxuan Xuanpin. Joseph Lam, Imperial Agency in Ming Music Culture, in Culture, Courtiers, and Competition: The Ming Court (1368–1644), Harvard University Press, 2008, p.276, translates this title as Classical and Civilizing Qin Music. He refers to a footnote in which he explains "civilizing" as 雅樂 yayue, there defined as "civilizing music" or "state sacifical music", depending on the context. Perhaps he explains his translation of the handbook title more clearly in another of his writings. In addition, on p. 299 Prof. Lam says that Fengxuan Xuanpin has, "154 annotated pictograms of performance techniques...the earliest known examples of their kind...." Here Prof. Lam seems to have included in his count the images of ancient qins; from my count the handbook has 33 sets of annotated pictograms, each consisting of two images as at right: one shows the hand in movement, the other a poetic representations of the same. 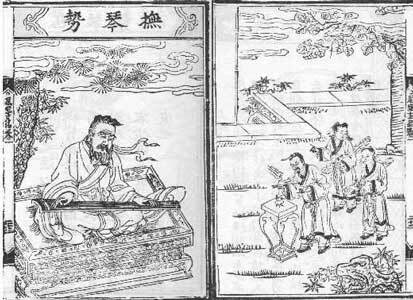 My translation of the image at right is with the one in what is generally said to be the earliest such collection, dated to the Song dynasty but surviving only in copies published during the Ming. 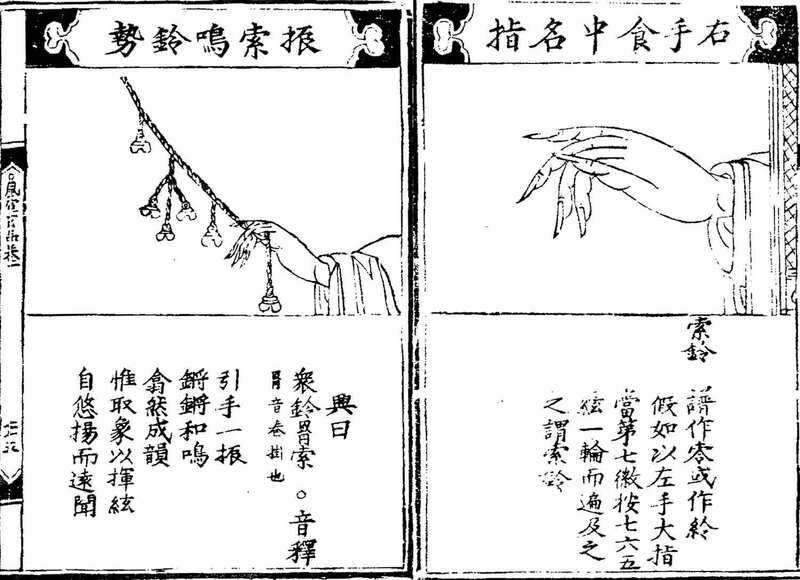 One of these is said to have been edited by Zhu Quan. "represented a significant change: the complex performance techniques not only indicate advances in qin composition and techniques but also suggest an increased number of literati qin players, amateur musicians who needed explicit guides. This may be a correct interpretation of the significance of the images, but perhaps it should be dated back to the beginning of the Ming. Does this image, from Fengxuan Xuanpin Folio One, p. 23 (QQJC III/19) depict Zhu Houjiao himself? His students? As for the use of incense this is discussed further here. Some of the melodies with lyrics are clearly songs, others seem to be instrumental pieces to which lyrics have been added. Regarding those that I have so far reconstructed, all could arguably have been sung; for those that did not seem to be singable I generally went to other handbooks to find ones without lyrics. For this region of central Henan province see further. Of the 34 melodies in Fengxuan Xuanpin with lyrics, six are the earliest versions of these melodies and five others were originally thought to be the earliest. Although I have transcribed into staff notation and recorded all eleven of these sung melodies, I will not be satisfied with the note values until I have been able to perform them with a singer. 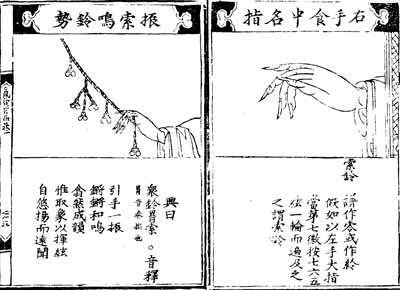 Of the 67 melodies in Fengxuan Xuanpin with lyrics, two are the earliest versions of these melodies and six others were originally thought to be the earliest. Those I have reconstructed (and recorded) comprise both of the former, five of the latter, pls two further melodies. Of the four not reconstructed all have lyrics, but mostly seem to be melodies that were not really intended to be sung. At present the transcriptions of Yi Qiao Jin Lü and Li Ling Si Han are only handwritten, not in my computer program (Encore).